The ring modulator in the 2600/TTSH can be DC coupled, so you can use it as a VCA for control voltages with the switch in the DC position. You probably won’t be using the ring modulator in every patch, and that means you often have a spare VCA for other interesting and useful duties. You could, for example, use the ADSR envelope to vary the amount of LFO modulation to a patch over time. Another typical application would be controlling LFO depth with a mod wheel CV if you don’t have a 3620 keyboard. There’s a musical effect that appears in Jean Michel Jarre’s Equinoxe IV that’s always interested me, and I’ve tried to replicate it on a number of systems. The best way I can describe it is that it’s like spinning rotors or blades. It’s a periodic sound that speeds up as the pitch rises, and then slows down as the pitch falls. 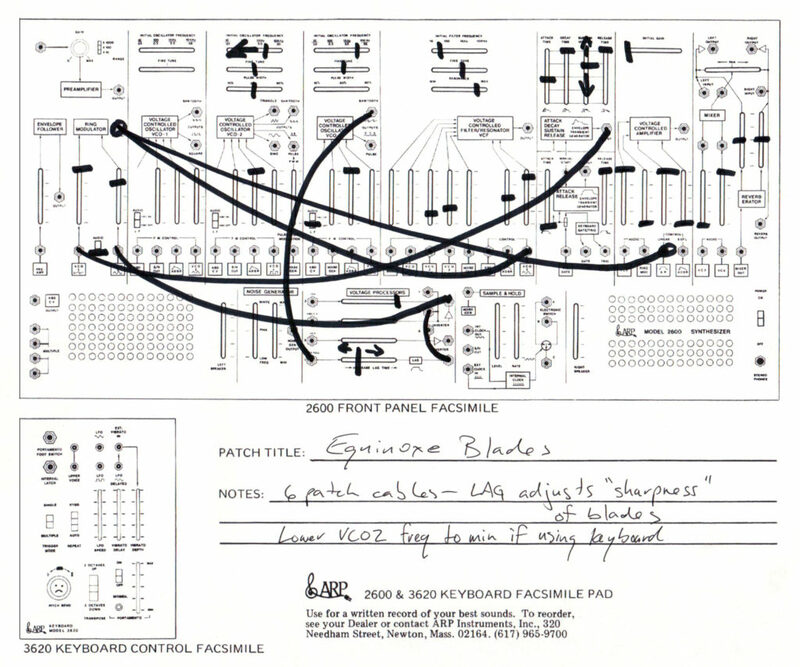 To accomplish this, you’d have an ADSR controlling the pitch of a VCO, as well as the speed of an LFO. Then you’d use the ADSR to control the depth of the LFO effect, as it’s applied to the filter (VCF) or amplifier (VCA) or both. Maybe it’s clearer if I demonstrate it! You can hear the sound at around the 3:00 mark in this clip. Keep in mind I’m just going for the gesture here, as it’s hard to know what JMJ might have going on in terms of hardware – he has a lot of hardware! If you want to take this video at face value, he did it with somewhere between one and six VCS3s. You can see a patch diagram of my version below. VCO2 provides the pitch sweep, VCO3 is our LFO, and both are controlled by the ADSR envelope generator, or EG (which is normalled and requires no cabling in either case). VCO3 direct out goes into the lag processor, to soften the sawtooth so it doesn’t make the VCA pop, then it goes into an inverter, so the effect goes pow pow pow and not wup wup wup. Finally, we multiply the original EG signal and the processed LFO signal together in the ring modulator, which is acting as a VCA. Still with me? This fades the LFO effect in and out according to the curve of our ADSR EG. Then we apply the output of that process to both the filter and the VCA. It’s not exactly JMJ, but the heavy lifting is done. You can also hear it in the context of my TTSH demo from the previous post.